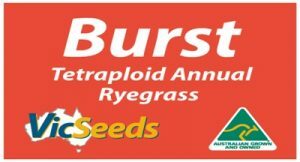 Burst Tetraploid ryegrass is a new Australian bred selection from the Vic Seeds program and is a cross between Abundant and New Tetila. The flowering date is approximately halfway between these varieties making it an ideal fit for those whom are seeking a mid-season maturing variety. Burst Tetraploid has excellent winter and early mid spring production with high quality digestible feed and like other Tetraploids will tolerate short periods of waterlogging. Australian bred variety with mid season maturity and high quality feed. Very good establishment vigour giving excellent winter early mid-spring production. Increased yield and disease tolerance. Ideal option for grazing and silage. Burst Tetraploid combines strong early establishment coupled with a mid-season maturity that will provide good production through winter and early – mid spring. 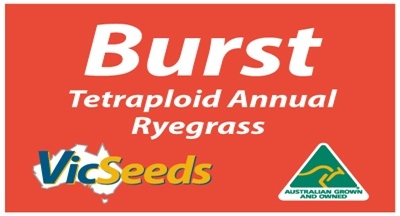 Where taken for silage Burst will provide an excellent supplementary feed option.